Colombia's largest left-wing rebel group, the Farc, says it "profoundly laments" killing two members of the Nasa indigenous group on 5 November. The Farc said the two indigenous guards were killed when a rebel drew his gun after engaging in "hand-to-hand combat" with one of them. 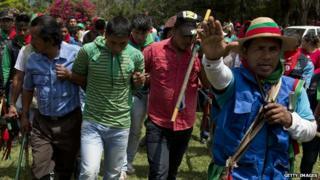 A tribal court has sentenced five rebels to lengthy prison sentences for the murder. About 220,000 people have died in five decades of armed conflict in Colombia. The killing of the two members of the indigenous guard, which carries out the duties of a police force in indigenous territories, caused outrage in Colombia. The two were shot dead after removing a billboard praising the late Farc leader, Alfonso Cano, near Toribio, in western Cauca province. In a statement published (in Spanish) on its website, the Farc allege that members of the indigenous guard attacked the rebels and "gave chase". They also say that after killing the two Nasa men, the rebels handed themselves in to the indigenous group voluntarily. This conflicts with the account given by the Nasa community, which says they arrested seven rebels and took their weapons off them. They tried them before an indigenous court and sentenced five to jail terms between 40 and 60 years, while two others will receive 20 lashes. Under Colombian law, indigenous authorities have jurisdiction in their own territories unless this contravenes national law. However, the sentence has been criticised by the United Nations representative in Colombia. Fabrizio Hochschild said due process had not been followed. He said any Colombian, even a rebel guilty of taking part in a murder, had human rights.